I went to find out. 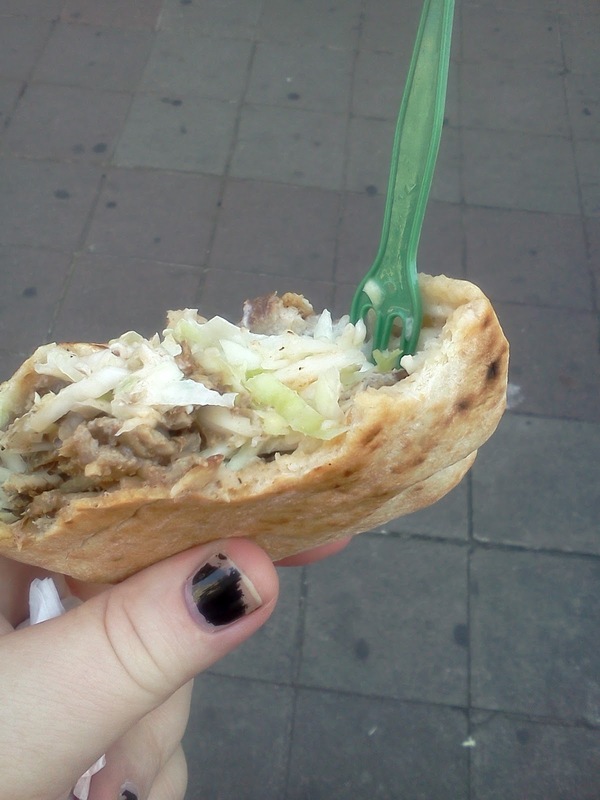 One of the things I'm learning is that most restaurants will love to have you sit down and order 25 Euros worth of food and drink, or you can, if your a cheapskate like myself, go inside order a single gyro and pay 3.50 for the luxury, then walk around and eat it. Same food, but a-la-carte, and way better for the budget. I went to one of the restaurants in Pita Alley today for lunch. My French seemed useless as they kept talking in a language I did not comprehend. Perhaps it was French, but to me it might as well been Latin. However I did manage the word "gyro" which involved a facial expression of understanding from the vendor, and who quickly made me a fist size stuffed flat-bread gyro with Greek coleslaw (not exactly sure what it's called) and the meat from the whirl-o-veal on the counter. Another dwarf fork stuck in the top, I handed them a 5 Euro and got back some change. Perhaps it was lost in translation, but it was then I think I actually got a pita by mistake... oh well... Off I went forking at my gyro/pita, and it was out of this world. The meat fabulous, the slaw out of this world. In fact, it may have been the best thing I've ate since arriving in Brussels, it was that good. Now I'm told, the thing to look for is a mitraillette gyro. A mitraillete is sub, typically with sausage or some goofy version of a hamburger on it, but the greek version uses the tangy gyro meat instead. I can only imagine it's out of this world. I'm told Plaka has them, but I'm looking for others. In fact I imaging there's lots of interesting sandwiches here in Brussels, I just have to find them.